Corel has launched PaintShop Pro X7 and PaintShop Pro X7 Ultimate, new versions of the company’s imaging and design apps for Windows. Among the featured updates are new editing tools, accelerated brush performance and an updated interface. Why use PaintShop Pro when you can use Corel’s flagship Painter 2015 app, which was also recently updated? 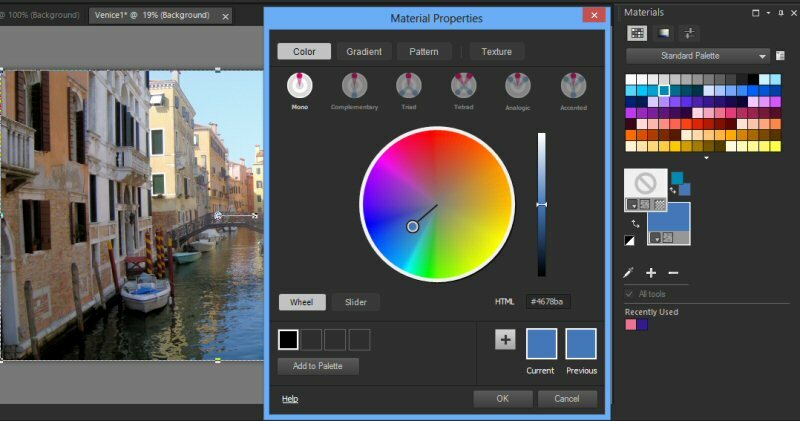 PaintShop Pro is an image editing application with some painting capabilities – similar to Photoshop, while Painter is a dedicated natural media paint app. PaintShop Pro markets itself as somewhat, though not wholly comparable to Photoshop, but with a significantly lower price and no subscription. Artists tend to use Painter in conjunction with an image editor, whether it’s Photoshop or PaintShop Pro. 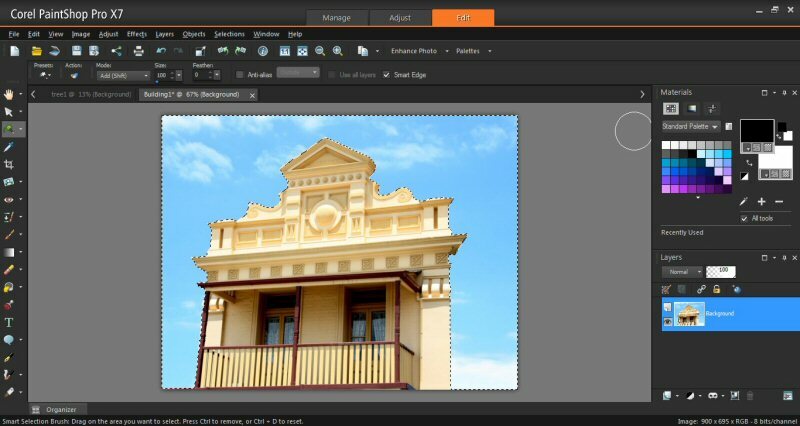 PaintShop Pro X7’s new Magic Fill feature offers content-aware editing to let you erase unwanted elements in a photo and replace them with content that matches even a complex background. 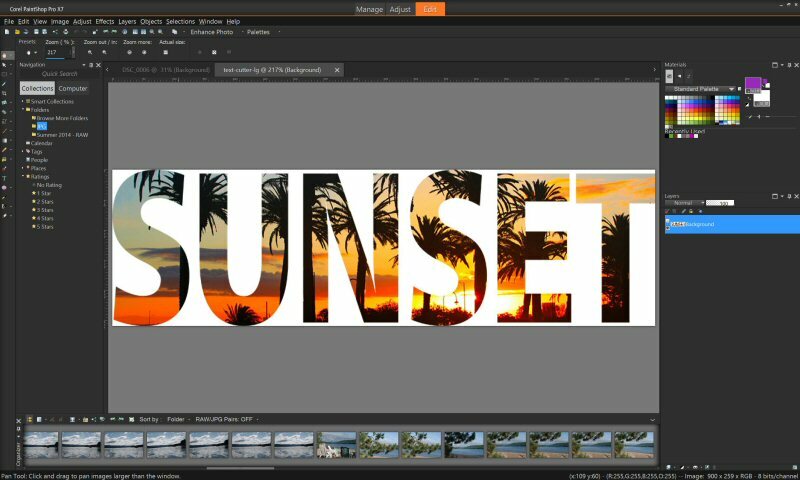 The new Text and Shape Cutter tools let you create a text or shape clipping mask from an underlying photo or image. The materials palette now features Color Harmonies to help you find appropriate colors, textures or patterns. Sample colors with a dropper tool to create your own custom palettes or to track your favorite color combinations. Or select one of the preset color harmony settings to see color suggestions. The new X7 version offers an updated image dialog to help you get started quickly by simply clicking File, New Image, choosing the project dimensions and customizing. Choose from canvas sizes for photos, print, web, graphics and multimedia. A Smart Edge feature makes it easier to control brush strokes when painting and drawing around objects. In addition, PaintShop Pro now reads and imports data saved in XMP files, making it easy to exchange files and work with other photo management applications like Corel AfterShot Pro. PaintShop Pro X7 also enhances existing features. It boasts a 30 percent improvement in brush performance with more responsive brushes, including the Paint Brush, Airbrush and photo retouching brushes. Because the app is now 64-bit, there are also general performance improvements as well. Effects are easier to use in the new version with a redesign of tools including Selective Focus, Vignette, Retro Labs, Graduated filters, Depth of Field, Smart Photo Fix, Red Eye Removal and Digital Noise Removal. The app gives you more control over layers by letting you drag a layer from one image to another and drop it between or above a specific layer in the layers palette. PaintShop Pro X7 Ultimate, an offshoot of the main program, includes add-ons such as Athentech Imaging’s Perfectly Clear, Reallusion’s FaceFilter3 Standard photo retouching for portraits and a creative collection of brushes, textures and royalty-free backgrounds. In other news, Corel announced the Corel Photo Video Suite X7, which offers PaintShop Pro X7 and VideoStudio Pro X7 for photo and video editing in a single package. Corel PaintShop Pro X7 and Corel PaintShop Pro X7 Ultimate are available now in English, German, French, Dutch, Italian, Spanish, Russian, Chinese Traditional and Japanese. They require Microsoft Windows 8/8.1, Windows 7, Windows Vista or Windows XP with latest service packs (32-bit or 64-bit editions). PaintShop Pro X7 costs $79.99, with an upgrade price of $59.99. PaintShop Pro X7 Ultimate costs $99.99 with an upgrade price of $79.99. 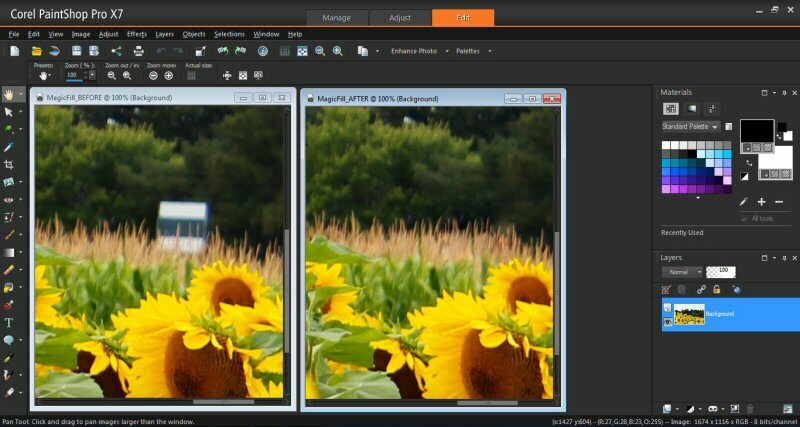 Photo Video Suite X7 costs $129.99, with an upgrade price of $99.99.